Friends and Heroes follows the adventures of two friends, Macky and Portia, as they fight for justice, and even survival, against the might of the Roman Empire. All three series are now available in Italian, a language not featured on our multi-language disks. 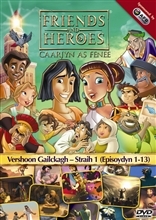 Each series pack contains thirteen x 25 minute episodes of Friends and Heroes on 4 DVDs. The first Series is now available in Manx, also a language not featured on our multi-language disks. This series pack contains thirteen x 25 minute episodes of Friends and Heroes on 4 DVDs. Please note that the Italian episodes contain Italian language only - there is no English soundtrack or English subtitles on these disks. The Manx episodes are in Manx language and include Manx and English subtitles. For details of titles and Bible stories on each episode please click on the pack you are interested in below.